Photo: Mohammad Kallon, organizing secretary, SLeTU. Aaron A Boima is an informal trader in Freetown, and the Secretary General of the Sierra Leone Traders Union (SLeTU). He is also the Co-ordinator of eight informal economy workers’ unions affiliated to the central trade union federation, the Sierra Leone Labour Congress (SLLC). He spoke to Chris Bonner, WIEGO’s Organization and Representation Programme Director, about organizing waste pickers in his country, whilst at the International Labour Conference, June 2015, in Geneva. In 2014 I began organizing waste pickers in Freetown, the capital city of Sierra Leone. I started small. Ten waste pickers from two dumpsites attended the first meeting. From there, I called meetings in four cities and at the end of this process 711 waste pickers were registered in four cities. 251 women and 460 men had participated in the discussions about their situation and why they need to be organized. 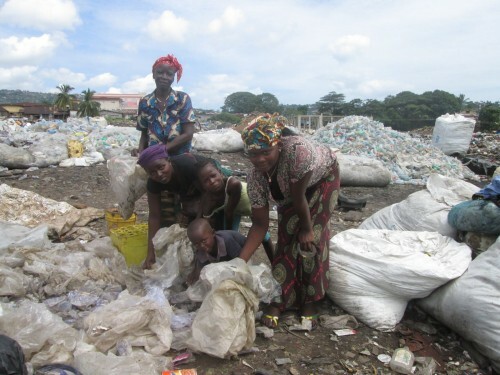 They took a decision to form the Network of Waste Pickers of Sierra Leone (NEWAP-SL). However the Ebola crisis in Sierra Leone disrupted the organizing activities. In one instance, for example, the dumpsite at Kingtom was used for burials as it is close to the cemetery, and Ebola victims were buried there too. So it was closed for health reasons. Of course this was absolutely necessary, but waste pickers lost their source of livelihood. As the Informal Economy Coordinator at SLLC I plan to negotiate with the mayor and the Freetown City Council to provide assistance and/or alternative work for the affected waste pickers – maybe in other jobs. I also see the importance of sharing information with other waste pickers in Africa and the rest of the world. I have already visited waste pickers in Lagos, Nigeria. I accompanied Sibailly Douhoure, StreetNet organizer, who met with waste pickers in Lagos on behalf of WIEGO. This inspired me to take forward the struggle of waste pickers in my country, and to help identify and recognize their activities as waste pickers.